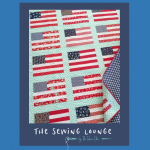 A fun, quick Patriotic quilt to display or gift for Memorial Day or 4th of July. Initial fee for the 2nd Wednesday of the month Gypsy Wife Quilt Group. There is also a $25/month fee that will be auto-billed February through September. If you missed the informational session, please contact the shop for more information. We all love those giant blue IKEA Bags. Kelly's version has all the space- but Oh So Much More when it comes to style & sturdiness! *** Instructor has decided that you may make which ever size you prefer in this class... LARGE (original), Medium or Small !! Initial sign up for the 2nd Sunday of the Month Gypsy Wife Quilting Group. There is also a $25/per month fee that will be auto-billed from February - September. If you missed the informational session, please contact the shop for additional information about this program. Fans of Delightful Desert, Fancy Forest, Lloyd & Lola...???? 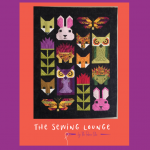 whatever your present obsession with Elizabeth Hartman patterns- bring along your project and join with others who are obsessed with these critters! 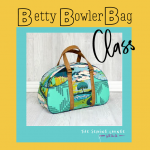 This vintage inspired carry-all features 4 exterior slip pockets, an interior zippered pocket and & piping for a professionally made look. Learn to make a basic woven tank. The pattern also has a dress version - endless possibilities for your summer wardrobe! 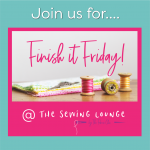 Join us to create this piece from start to finish - You will learn basic cutting and marking of garment pieces, placing patterns on straight of grain, garment fitting and construction, darts, and neck & armhole finishing. The Necessary Clutch is not your ordinary wallet. Carry your cash, cards, coins & cell phone- and still have room for your favorite lipstick or personal items. You will have a zipper pocket, 12 card slot pockets, and 2 long pockets for cash, checks or receipts. With the closed ends, everything stays secure! You can choose between a snap closure or a magnetic fastener. 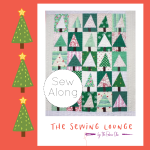 Get in the Holiday Spirit by joining us for this festive tree quilt sew along! We now have a Summer Session to get you started on a Holiday Quilt or Gift, and a Fall Session in case you need to finish up. 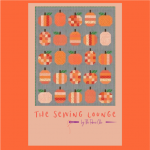 Join us for a Pumpkin Quilt Sew Along! Finish a Quilt you've started, or join the fun by making a throw in time for Fall. An insightful 90 minute lecture with exclusive information on what will be new in the new innovative production and promotion of Aurifil. An introduction to Aurifil thread weights, tips on the best uses for each weight and care instructions. Enjoy inspirational collection of artworks made by popular designers using Aurifil threads. Spend a wonderful evening with Anna Maria Horner! Cost for Maria Shell Workshop is not free - Sign- ups for this event to be done through the Kansas City Modern Quilt Guild, and fees can be found in the Guild newsletter. 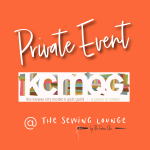 Tia Curtis Workshop- Sign-Ups for this event to be done through the Kansas City Modern Quilt Guild. 3 Dog Design Workshop - Sign Ups to be done through the Kansas City Modern Quilt Guild. This is a private event; not open to the public. 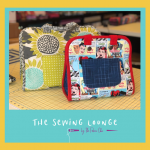 Need to sneak in a bit of extra sewing during the week? 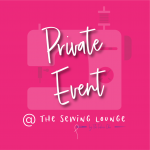 Meet up with your friends at the Sewing Lounge for an evening of Sewing and your choice of sipping - we'll provide coffee - bring your favorite wine to sip or share, and a snack or order dinner in. 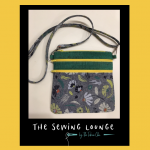 If you are enrolled in either of our Gypsy Wife Sewing groups- this Sew Day is FREE to the first 20 people to sign up. 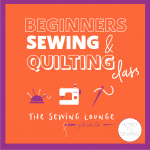 Provided to give you some extra sewing time in the lounge, group support, encouragement & just plain fun! Spend the day with the amazing Jennifer Sampou!! This stylish table runner features a pieced background created with Octagon Shimmer Templates with raw edge appliqu? tree clusters to enhance the nature inspired design. Good News! By July The Fabric Chic will have 2 Certified Teachers for Laura Heine Patterns!! We don't have all the details for this workshop yet, but if you're a fan of these wonderful collage patterns, you'll want to mark your calendars. New patterns are being released, and we will get details out as soon as we can. *** THE PRICE IS NOT FREE AS INDICATED BELOW- THE COST OF THIS WORKSHOP HAS NOT BEEN SET YET.